Before bringing you the regularly schedule installment of the alphabet series, I'd like to take a minute to share something exciting with you. As I've confessed before, I am addicted to Instagram. Well, this addiction has introduced me to other people in parts of the world I'd never have access to before. We stalk each other's feeds, comment on our photos, and sometimes even extend our communication into email. One such Instafriend propositioned me in an email to guest post with her. This idea was completely foreign to me. She wants me to write for her blog and her for mine? This wasn't something I ever considered before, mainly because I'm still a little shocked that anyone other than my family and friends even read this little blog of mine. But why the heck not, I thought; it could be fun. Fun? Yes. Hard? Most certainly! Harder than I thought it'd be. I experienced the old case of writer's block I thought I'd left behind in my college English minor days. I pooped out a post that left me feeling unsettled. It was stuffy and editorial and so not the voice and point of view I feel like I've established here in my own safe, cozy blog world. So I scrapped it, X'd out of Microsoft Word and logged onto my own blog. Feeling comfortable and at home, I typed away. If you're interested in reading the end results of my guest post, visit Shawna's blog: Dovetail Blog. While you're there, look around and see what she has to offer. You just might like what you see. Since we didn't make it to the library this week, I collected information on the internet and made a little booklet on elephants. And we recycled an old book I created for a past unit on outer space, as well as digging out solar system books from our own personal library. 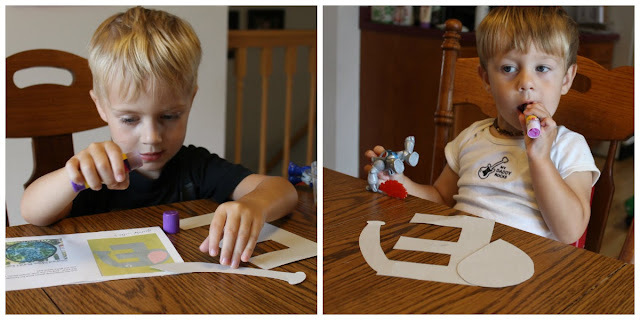 We created elephant Es for our door alphabets. In addition to the homemade booklet, we also researched elephants on YouTube. We only made it partway through one video of elephant noises because it scared the boys. Who knew elephants could be so terrifying? The second video was much more enjoyable--a baby frolicking in a mud puddle. Our other E topic was earth. We reviewed the information on our planet, as well as the others. 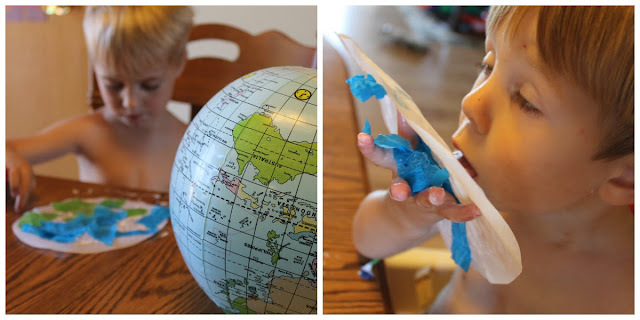 And we made our own version of the earth using parchment paper, glue and tissue paper. Ashton spent the majority of the time alternating between trying to unstick the gooey parchment paper from his hands and eating the tissue paper. Once the project was complete, I had to unroll his crinkled planet and lay it flat to dry. 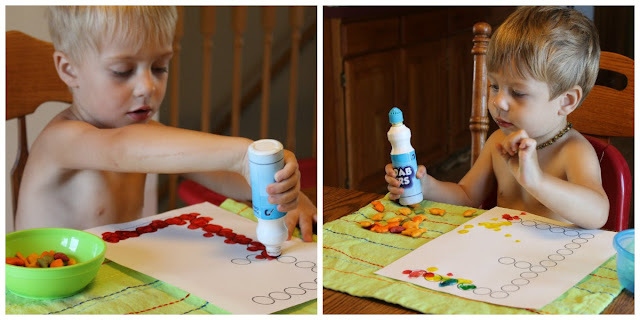 Our last project was a simple Do-A-Dot E page. We did squeeze in a spontaneous sidewalk chalk alphabet game on the driveway, too. I'm constantly trying to engage the boys in learning with everyday play. Mostly it's waved away in favor of something more entertaining. So I was a little surprised to find Spencer a willing participant in the game, even if it only lasted a few minutes. 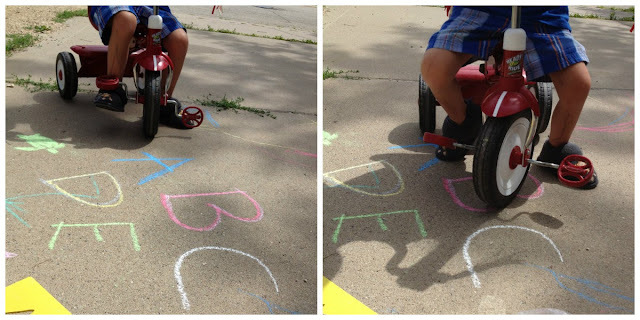 I scribbled letters on the driveway and then asked him to roll his bike tire over whatever letter I called out. He got a few correct and then pedaled away from the game. Eh, any participation is a win in my eyes.